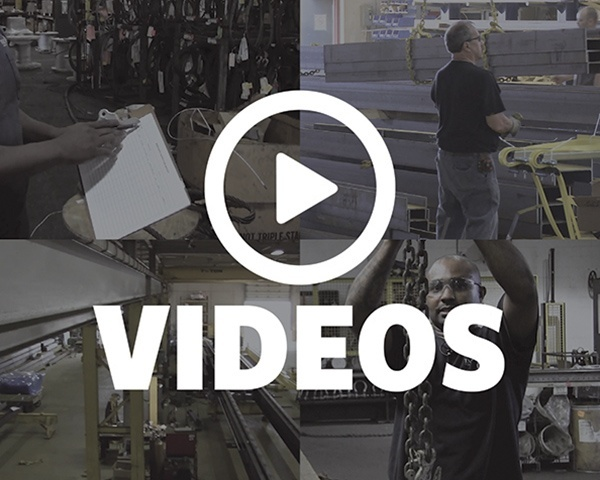 With over 40 years of experience in the engineering and manufacturing of overhead cranes, we’ve partnered with customers with all different levels of knowledge regarding overhead cranes. We realize that each person we work with may need some help filling in the blanks regarding different aspects of what an overhead crane is, what an overhead crane does, what types of overhead cranes are available, and which class of overhead crane may be best for their business. In this article, our goal is to unpack some of these questions and break them down into their simplest format. 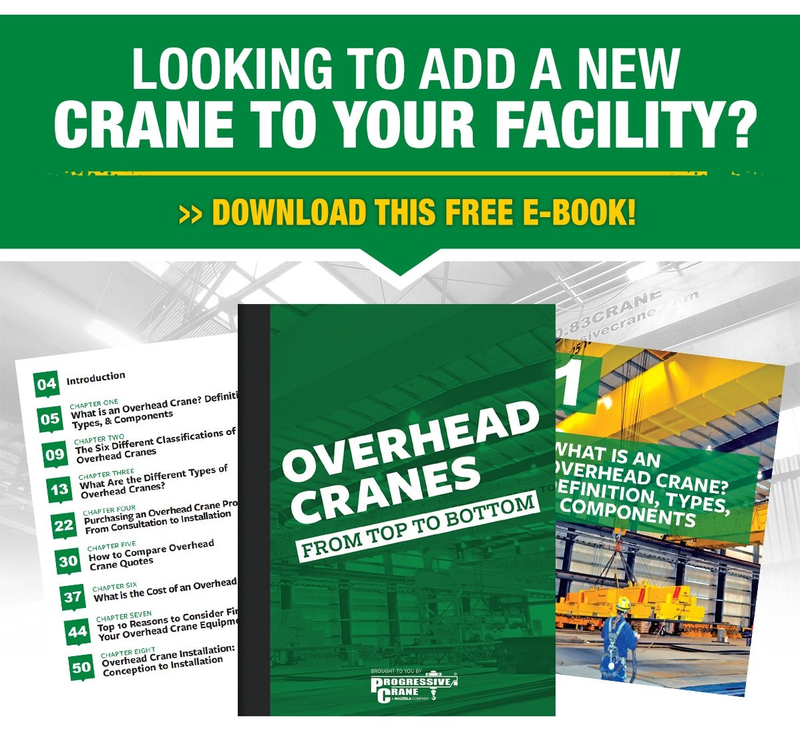 We want to help you establish a base-level understanding of overhead cranes and how you can select an overhead crane that is best suited for your business’s needs. 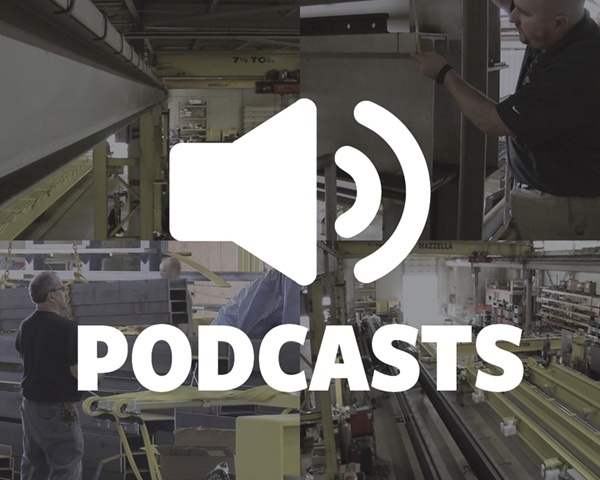 Podcast: What is an Overhead Crane? WHAT IS AN OVERHEAD CRANE? Efficiency—Overhead cranes are more efficient than using a group of workers or tow motors to lift and move material and can work up to 2-3 times faster. 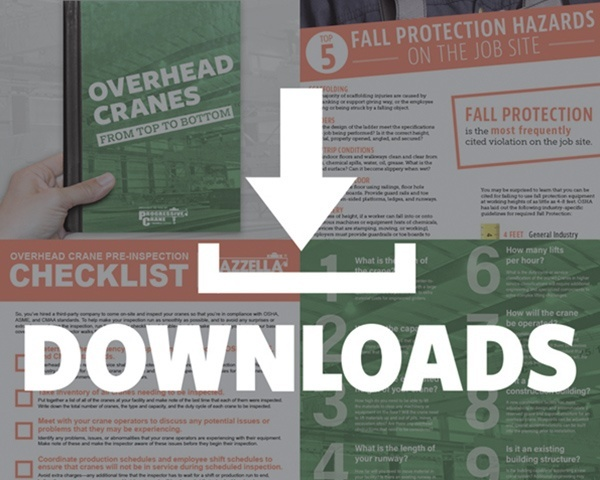 Think about how a manufacturer, mill, or warehouse can streamline their processes and procedures by introducing an overhead crane to automate the lifting, maneuvering, and unloading of materials at their facility. Safety—Another advantage of installing an overhead crane in a manufacturing, assembly, or warehousing facility. Cranes can be used to lift and move materials in extreme environments and can handle corrosive or dangerous materials like hot metals, chemicals, and heavy loads. A workstation or jib crane can be put in place to help workers move heavy objects in a controlled manner and help cut down on repetitive motion injuries and muscle strains. WHAT ARE THE COMPONENTS OF AN OVERHEAD CRANE? 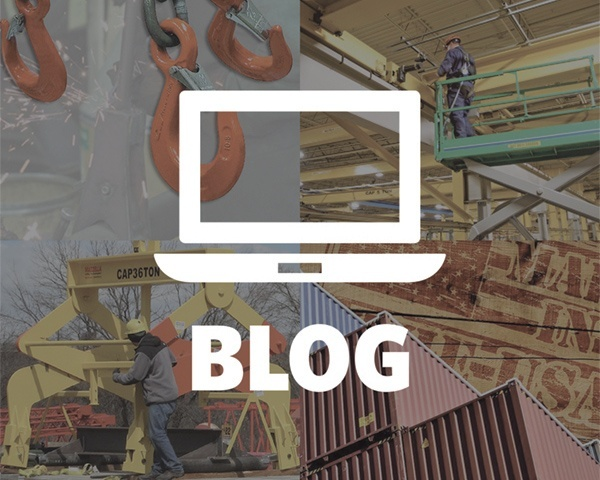 In order to get a better understanding of some terms we’ll be using later when we describe the different types of overhead cranes, we’ll discuss the different parts and components of a crane, and how they can affect performance and design. HOOK – The lifted load is supported using a hook which connects to the hoist. HOIST – The hoist is what makes the lift and holds, raises, or lowers the load using wire rope or chain. Hoists can be powered manually (by hand), with electricity, or with compressed air (pneumatic). Top Running – Trolley wheels run on rails fitted to the top of the crane beam. Most frequently seen in higher-capacity double girder designs. BRIDGE – A load-bearing beam that runs the width of the building. This is the primary structural component that connects the runways and moves the hoist forward and backward using a trolley. A bridge can be comprised of one or two beams—more often referred to as a single girder or double girder design. Girders can be made of rolled steel or can be fabricated by welding the beams into a steel box design. RUNWAY – What the bridge crane travels on to move the crane up and down the bays. These are typically part of the building structure, as beams, and there are two (2) per overhead bridge crane system. RUNWAY RAIL OR TRACKS– Rail supported by the runway on which the crane travels. Top-running cranes typically run on ASCE/railroad rails. Gantry cranes can also utilize a rail or track system installed in the floor to move the bridge back and forth. END TRUCKS – Located on either side of the bridge, the end trucks move the bridge up and down the runway utilizing a series of wheels that ride on the rail. Each end truck can have a configuration of 2, 4, or 8 wheels based on the crane’s capacity. BUMPERS – Bumpers are designed to absorb the crane’s energy and reduce impact—bringing the crane to rest in a controlled manner and minimizing forces when the crane or trolley reaches the end of its travel. Bumpers can be attached to the bridge, trolley, or runway stop. CONTROLS – Controls are typically mounted in a panel on the crane or hoist and the pendant or remote radio console allows the operator to run the crane. The controls operate the drive and hoist motors, and can control Variable Frequency Drives (VFDs) to control hoist speed for precise load positioning. ELECTRIFICATION – Insulated conductor bars or festoon systems (flat cables) bring power to the crane from the building. A bridge crane is a type of crane that includes two overhead runways built into the building’s support structure. A single or double girder configuration, called a bridge, moves the crane up and down the runways, and the trolley and hoist run side-to-side along the bridge. The trolley allows the operator to position the hoist and hook, prior to raising or lowering a load. Bridge cranes have different configurations including single girder and double girder designs, and the trolley and hoist can be designed to be top-running or underhung depending on the design of the building structure and the requirements needed to make the lift. Double Girder – There are two girder beams that make up the bridge, and they are supported by an end truck on each side. The trolley and hoist run on a rail installed above or below the bridge girders. Double girder cranes are recommended for heavier-duty applications where the crane has to handle heavier capacities and longer spans. Process Cranes – A process crane is built for a specific need, and these types of cranes are heavy-duty (mainly Class D, E, and F cranes) and in constant, or near-constant, operation. They’re typically a top-running, double girder design and have a lot of engineering built-in to perform high capacity lifts, or to perform a very specific task over and over again. Process cranes can be found in places like automotive assembly plants, steel mills, container yards, lumber mills and are performing anywhere from 10-20 lifts per hour at around 50-75% of their rated capacity. Modular Cranes – Modular cranes are typically found in smaller manufacturing facilities, smaller-sized mills, or machine shops, and have a design consisting of a more base-level hoist, trolley, and bridge. They’re economical and affordable solutions to moving material through a facility and don’t normally come with a lot of extra bells and whistles. These cranes are typically Class C and are being used at around 40% capacity, but can be bumped up to Class D with extra engineering built-in if the lifting application requires it. A gantry crane is similar to a bridge crane, but instead of moving on suspended runways, the crane uses legs to support the bridge, trolley, and hoist. The crane legs travel on fixed rails embedded in, or laid on top of the floor. Gantry cranes are considered when there is a reason not to incorporate an overhead runway system. They’re typically used in an outdoor applications where full beams and columns can’t be installed, or may be used below an existing bridge crane system. Gantry cranes can most commonly be found in shipyards, railyards, special outdoor projects like the construction of a bridge, or in places like steel mills where overhead room may be an issue. Most commonly found in a production or assembly line, this type of crane uses a trolley to carry the hoist along a single path. The trolley is designed to connect to an I-beam and runs along the flat surface on the bottom of the beam. These cranes run material back and forth in a straight line or can be designed to follow a curved track with switches, branches, and changes in elevation. Monorail cranes are designed for lifts that do not require the side-to-side trolley movement provided by the bridge in an overhead or gantry style crane. Jib cranes come in a number of different styles and types but do not utilize a runway or track system. They can be stand-alone or column / wall-mounted and offer a wide variety of capacities, heights, and spans. Jib cranes are space-saving, economical, and are ideal for jobs like maneuvering or moving items for assembly within a small area. They can typically offer 180-360° of rotation, and even small ones can hoist several tons of material. Workstation cranes are designed to allow the operators an ergonomic means of moving or lifting loads with limited effort in a smaller size work area. Workstation cranes are typically lighter-duty systems lifting materials from 150 lbs. up to 2 tons in capacity. They’re designed for repetitive lifting of loads and increase worker productivity and ease work flow. Workstation cranes can be freestanding or ceiling-hung and can be designed as top running or under running. Workstation cranes are so appealing because they're versatile, able to be customized, and can be expanded via modular design. We hope that this article was able to give you a better basic-level understanding of what an overhead crane is. In the simplest terms, an overhead crane moves materials, or heavy objects, from one location to another in a precise manner. A crane’s design can be as simple as a jib crane that moves material within an arc of 5 feet during product assembly. Or, it can be as complex as a 50-ton double girder top-running bridge crane used for hot-dip galvanizing in a steel mill. At Mazzella Companies, we have two companies (Progressive Crane and FHS, Inc.) who design and build world-class overhead crane systems. We have over 40 years of experience in the overhead crane industry and can build custom solutions ranging from light-duty economical cranes to large-capacity, high-duty cycle cranes. Our work is done in full compliance with CMAA, NEC, OSHA and ASME standards and we have extensive electrical capability, as well as AWS certified welders on-staff. We offer in-house engineering that can furnish PE (Professional Engineer) stamped drawings and calculations and can also design custom below-the-hook lifting solutions for your unique project needs. We welcome the opportunity to address your overhead material handling needs. If you’re interested in learning more about how an overhead crane system can improve the efficiency and safety of your facility, or want to schedule a consultation, contact us to speak with a Crane Specialist. Next Article What are the Different Types of Overhead Cranes?